Last month my new puppy arrived from Australia. He is co owned by me and my good friend and lives with me and will be trained and shown by me. Jager (pronounced YAY-ger) is six months old and has won several Best Baby Puppy in Shows and Baby Puppy group placements in Australia before coming here. He is a beautiful dog with a wonderful and lively temperament like the breed calls for. I adore him. Yesterday he had his first show in America! It was only he and three specials and he won Best of Breed and picked up his first major. He had a wonderful time. He was great for his table exam, being stacked on the ground and gave me nearly flawless free stacks. His movement was another story. There were moments of nice movement, certainly enough to garner him the breed over specials, but it was not clean at all. There was a lot of pulling and shooting out, head down and jumping around. Based on our training, I had a feeling this would be the case. 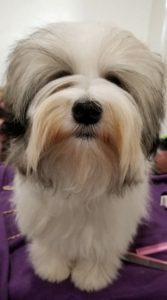 He is doing very good at home, but it is just coming together at home with no distractions and I figured that the excitement and distraction of the show, other dogs (which he loves) and tons of people (which he also loves) would be a lot for him. If you know anything about me you know that leash corrections are not an option for me. I am a trainer, not a handler. I am doing this for a fun activity with my dog, to show the dog community this beautiful dog and to better the breed. 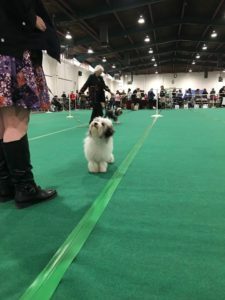 I love to spend the day or the weekend at the dog show hanging out with my friends and doing what I love to do. 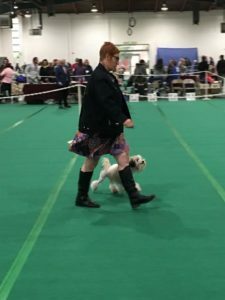 I do not get paid for showing or winning with my dog. Winning will not affect my income. This is the beauty of being an owner handler, I don’t have to worry about a client being disappointed, I only have to worry about training this dog, presenting him and building and strengthening my relationship with him. Sure, I wanted him to gait properly a bit more than he did, but I was not going to punish him into doing that. I need him to love the ring and it is critical to me that his time in the show ring is very enjoyable to him. 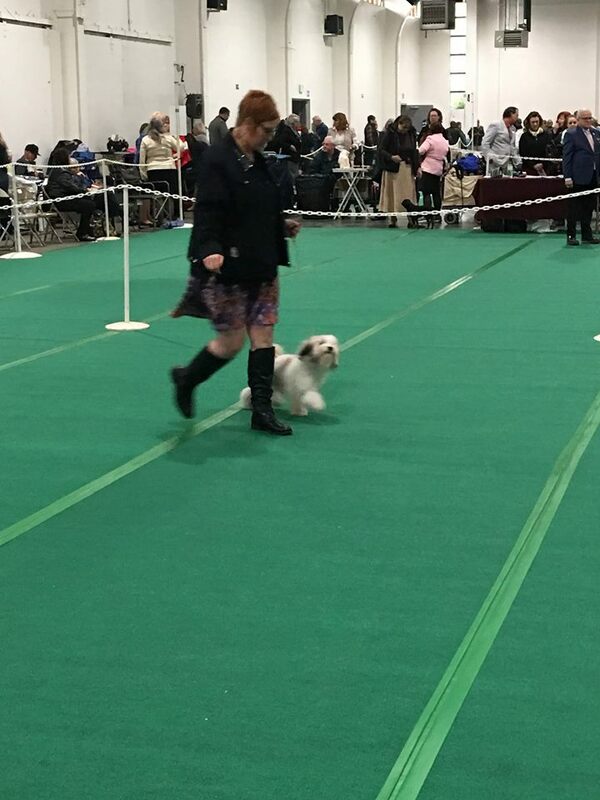 He did not get a placement in the group but the judge commented to me, “I hope you are having as good a time as he is” which was damn near as good as a group placement for this baby dog. So, back to his movement. I decided to write an article about how I plan to work on this behavior and where I start. In Part One I will talk about what my plan is and how I design it and in Part Two I will discuss how my plan is working. I cannot say when I will write part two because it will depend on how my plan works, how he progresses and simply how long it takes. The first thing I need to look at is exactly what the issue is. I am not going to use labels like “naughty”, “hyper”, “excited” or “stubborn”. While I do believe that a part of his behavior had to do with arousal, I believe that piece will be worked out the more we go to shows. If I suspected that there was an “issue” where he was so distracted he couldn’t think or perform then I would definitely put a desensitization plan in place to ease him into shows, but that wasn’t the case, so I am going to go right to work on the behavior itself. One way to change behavior and the only “quick fix” in my opinion is changing the antecedent or set up. Changing the antecedent is not training, it simply makes it so the behavior doesn’t occur. For instance, I have several dogs that bark at the large front windows of my house when people walk by with dogs. Because I was too lazy and it would be more work than I care to do to train all the dogs to be quiet I bought frosty window covering so they can’t see out. Problem solved. I am fine with quick fixes like that as long as they do not cause harm or are not aversive to the animal. Another antecedent change would be putting up the garbage can so the dog can’t get into it. 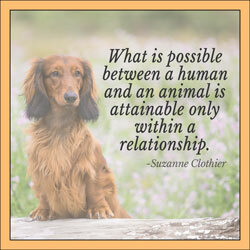 If the can is not available to the dog the behavior of going through the garbage cannot occur. Some people might use a collar that is more aversive, like a choke chain to change the behavior, but I am not interested in just stopping the behavior. I want to actually train the dog to be able to perform, I don’t want to manage him with equipment. I will be using a clicker to mark the exact moment he is doing the right thing. This is extremely beneficial to gaiting work. Circle work – this is where I work the dog in large circles to the right reinforcing any trotting. Move from circles to straight movement, reinforcing any trotting. I will do circles and reinforce often and then right from the circle move to a straight down and back always reinforcing trotting. I will be a little chunky on my training here because I will also be reinforcing four on the floor. Any time he stands instead of jumping up on me, I will reinforce. It doesn’t matter if the stack is perfect, it matters that he stands instead of jumping up. I can make that a perfect free stack later. That is my plan! While this is my plan I will be flexible if I need to depending on the response I get from Jager. Be on the lookout for Part Two.